1.) Tent- Well duh! 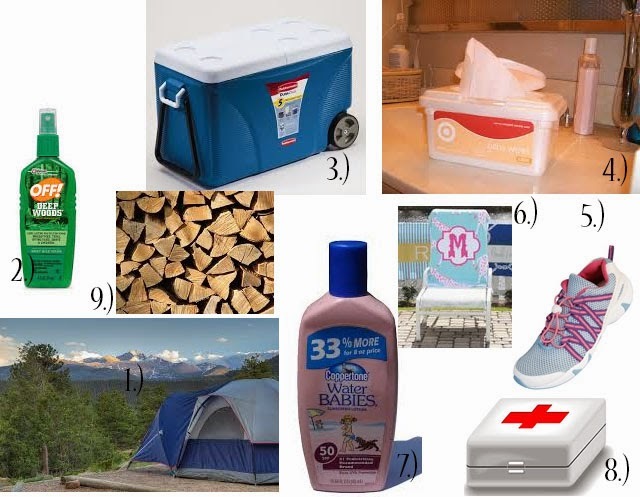 But you really want to make sure that it is a good tent and not some cheapo flimsy thing. If it does rain you want it to hold up well and not leak which is why spraying the tent with water repellent spray before your trip is a very good idea too! 2.) Bug Spray- Whether it is our all natural bug repellent that we discussed yesterday, or a bottle of OFF! you NEED this or else you will get eaten alive. The aftermath of little mosquito's feasting on you is much worse than just grabbing a bottle of bug spray and spraying yourself down real quick. 3.) Cooler- This is another obvious must have as you are going to want to keep all of your food and drinks cool so that they do not spoil. Also bringing freezer Ziploc bags is a great idea as you will be able to divide foods up into sturdy bags and close them up safely without worrying about their original bag/box tearing and opening up or things leaking. 4.) Wipes- Wipes are always important. Whether you just want to wipe down and freshen up mid day or you need to wipe up a mess, these babies come in handy more than you would realize! 5.) Water Shoes- If you plan on going in a river or a lake you need these. Rivers have rocks that hurt to walk on bare foot and wearing flip flops is not even an option, unless you want to go back to your camp site minus 2 flip flops. I have tried to be thick headed and wear flip flops as well as go bare foot, I will never do that again. 6.) Beach Towel- Perfect for laying out or drying off after a dip in the river. Although this seems like an obvious item to add to your list, a lot of people do often forget it. 7.) Sun Screen- Do I really need to say anything? YOU NEED IT! 8.) First Aid Kit- This is super important to have. Although you are out to have fun you must remember, you are in the wild, it's better to be safe and prepared always. 9.) Fire Wood- Depending on what type of camping you are doing, if you are at a family/group camp site bring wood! The stores that are located on the campground have wood for you but it is ridiculously priced. Stop at a local store and pick up a few bundles to last you the night for way less. 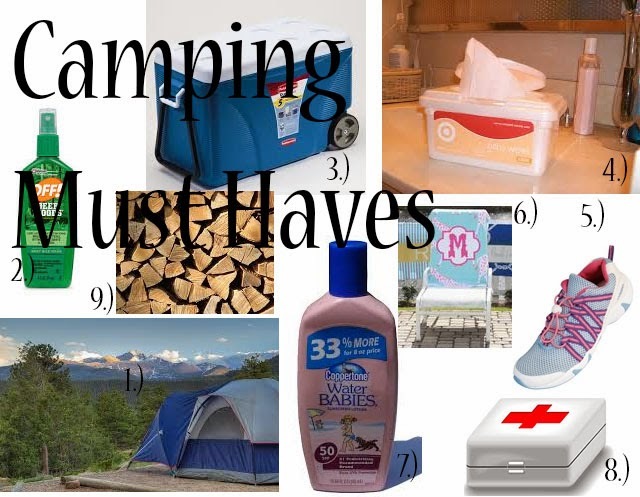 What is on your camping must have list? I would have to say a lantern of some kind is a must to help you get around at night. Love camping!